The Kidrobot x Adventure Time Pins Available Now! For a lot of preteens and teenagers, today was the first day of school. Lucy for us, our customer demographic is nooooot usually in that age range. 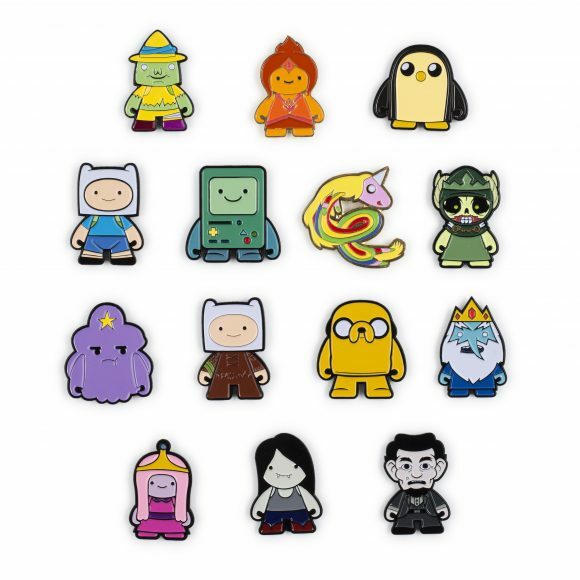 For those who are a bit older and wiser, we come to you again with the chance to wear your favorite characters and friends right on your jacket, purse, man purse, whatever as we release the new Adventure Time Enamel Pins. Here to say a little more on the release of these awesome collectibles is our favorite, Chris Holt aka The Toy Viking. What time is it? If you said anything other than Adventure Time you completely dropped the ball. Unless you said time for dinner, then you and I are best friends. Kidrobot is making your jean jacket three times as heavy with pins from Adventure Time!! Has anyone tried to go through one of those airport scanners with a shirt full of pins yet? It has to be a shirt because you could easily toss your coat on the conveyor x-ray. Would they make you go in that little mystery room and do a full on search because of your brazenness? Or would they accept the fact that your pins are indicative of your status and let you pass like the royalty you are? There’s only way to find out, so load up on this blind boxed series today, and the next time you go on a plane walk through security like the baller you are. Available now at at your favorite place, www.kidrobot.com where you will find these and all other Adventure Time Fun!